# This location is directly with the owner: see 2 more accommodation n ° 1035609 "Panorama du Golfe"
and n ° 923246 "In the Oaks" = to note the n ° of announcement in the place of the name of the city to see the lodging. You are at "Olive Bleue-cogolin" Tourism accommodation classified official state approval. PRIVATE POOL FOR YOU ONLY. Come and relax, share our tranquility. The property and in 1 place close to the shops. The great strength of this rental is its private pool area with the double kitchen so a Pool-House facing south. Note: Pool & Pool-house closed in low season (November to March). Secure, fenced, private parking, motorized gate. Wall-mounted air-conditioned rental, 3 large rooms: 1 large room 36m² 1 bed 160cm with mattress and relaxation 1 Mattress relaxing electronic back massage and Table Billiard. A very large living room Fully equipped kitchen materials of great qualities. Dining room, TV, sofa bed. A very large bathroom. Angle bathtub & 2 sinks. All this with 1 WiFi access. ESPACE POOL-HOUSE: entirely private, it includes a fully equipped summer kitchen, plancha, electric BBQ & charcoal, fridge, microwave, induction hob, kettle, espresso, 2 tables, chairs, dishes, kitchen utensils . In this space there is a shower & toilet. A garden for lounging or sunbathing at your disposal. For sportsmen, a badminton net, these rackets, and a ping-pong table are waiting for you! The rental is 1 large space of 87sqm in the top of the villa. Only one rental in the Place. The owner is next door, we are discreet & available with the pleasure of receiving you. Hairdresser service possible on site if needed. 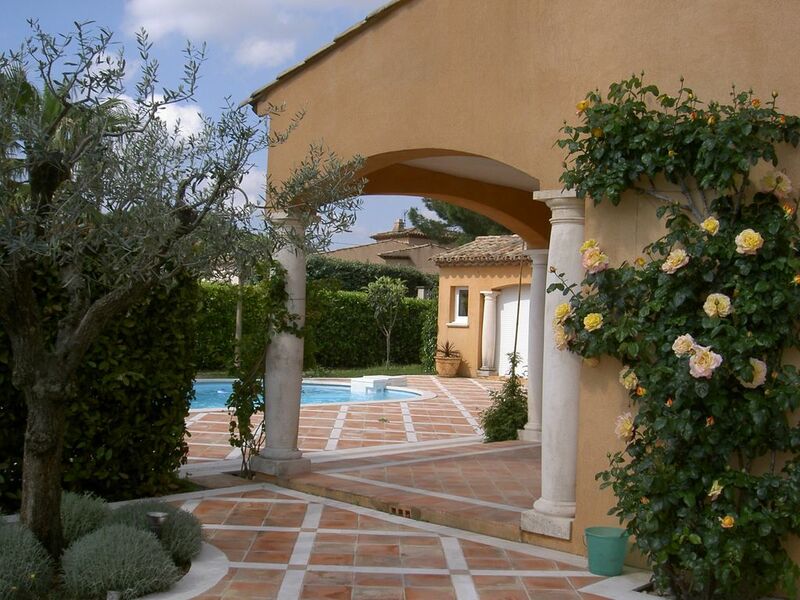 The property is 800m from the Village near amenities at 350m and the countryside. - 1 rental contract will be sent to you: 'online PDF specimen' take note of the owner's contract 'translated and available also in English. - To not be debited, the deposit will not apply online but will be mandatory upon arrival: check French or cash 620 € returned the day of departure. - Electricity: from October to the end of April is in supplement on consumption meter. has been found, if it is not respected the price will be deducted from the deposit, then it will be made by a company at the urgent intervention. - The place did not fit the animals. - Make your stay an experience that meets your expectations thanks to good communication between us: before, during and after your stay. RECOMMENDED PERIODS: Out of season, the gulf and more Zen. The stay with us will please you share its location close to the countryside, close to the splendours of the Gulf & trendy evenings. Everything is gathered to diversify your calm or hectic activities. This house in Cogolin is a beautiful, well equipped appartment, 10 minutes walk from the centre of Cogolin. The family is very kind and helpful. It is problaby unkind to say but they are a little bit “un-french” in this way: they do correct and directly wath they promised you. The appartment is on the first floor of the owners house and is spacious and very well build. You can see that it is build by a good contractor (he is the head of this family) who loves working with tiles. The masterpiece is the bathroom with two washbasins, one for each. We never saw, not even in the best hotels a bathroom like this. A bath with an overbath shower, toilet and bidet and the two already mentioned washbasins. Beautifull coloured tiles. The kitchen is well equipped with best products. A very spacious bedroom, good bed and plenty wardrobe. Your car is safe behind an electric gate. Downstairs, in the garden is a private swimmingpool with summerkitchen, toilet and shower, gardenset and parasol. Wonderfull! In the past we often visited England and Scotland and hired marvellous cottages, this one is in the highest category we ever rented. The Golf of Saint Tropez is directly in the neighbourhood, Saint Maxime, Beauvallon, Grimaud and Saint Tropez, all reacheble in less than half an hour drive. Day trips to Aix en Provence, Nice, Saint Paul de Vence etc. Pour l'aboiement, effectivement il était occasionnel, l'animal n'était que de passage. Ravis de savoir que vous avez passé un bon séjour. Alle vorhanden, was man braucht! Viel Platz, in der Wohnung und am Pool. In der Wohnung sollten sich große Menschen ein wenig "vorsehen", es ist eine Dachwohnung und an einigen Stellen "nicht so hoch (Aua!). Doch dafür ist man ja selber verantwortlich ;-)! Nous veillons à fournir une prestation propice à la détente et repos. Merci pour votre courtoisie avec la quelle vous avez occupés le lieu, et au départ nous avons été flattés d'apprécier, 1 Magnum de grand cru de notre région, nous vous remercions encore. C'était un plaisir de vous connaître, et un enthousiasme sera de vous accueillir encore mieux. Marie-Cruz F.
Wir verbrachten hier eine tolle Woche in dieser wirklich sehr schönen und sauberen Unterkunft! Auto steht absolut sicher, geschützte Anlage. Wir waren rundherum zufrieden und kommen gerne wieder! Vielen Dank für Ihre Freundlichkeit und dafür, dass Sie sich die Zeit genommen haben, Ihre Meinung zu schreiben. Schöne Urlauber mit großer Freude bis bald in der Unterkunft: L'olive Bleue-Cogolin. Comme toujours des propriétaires très serviables. Un logement avec tout ce qu'on a besoin ainsi que proche de toutes commodités. * POLITIQUE ET RÈGLES DE VOTRE RÉSERVATION: *Pour le confort de tous, nous seront strict sur ces points : - 1 Contrat de la location vous sera envoyé: 'spécimen PDF en ligne" "prendre connaissance du contrat du propriétaire" - Pour ne pas être débitée, la caution ne s'appliquera pas en ligne mais sera obligatoire à l'arrivée par chèque Français ou en espèces 620€ rendue le jour du départ. - La capacité dans la maison est au maximum de 2 personnes, possible 3 en supplément nous contacter. - L’électricité: d'octobre à fin avril est en supplément sur consommation compteur. - Le linges si vous le souhaite il est en option: serviettes de cuisine, salle de bains, et les draps ,(lits préparés à votre arrivée) tarif 18€/personne, à préciser lors de la réservation. - Location matériels Bébé en option: Lit/Draps/Baignoire/Maxi-Cosi/Stérilisation & chauffe- Bib.exct... - Le nettoyage sera laisser dans l'état de propreté comme il à été trouvé le jour d'arrivée, si celui- ci est non respecté 120€ sera retenue sur la caution, alors il sera effectue par une entreprise au prix d'intervention pressante. - Le lieu n'ai pas adapté aux animaux . - La piscine est le Pool-house ne sera pas utilisable en période hivernale: de novembre à mars se sera fermer.